If you want to use the :python or :pyfile commands or the omnicompletion plugin of Vim on a Mac with EPD, you will most probably want to recompile it with the Python support linked on the EPD instllation in place of the Mac Python. This will ensure you use the default Mac installation in 32bit mode. Do the same for all the python calls in the Makefile. The second example I wrote while testing how easy it is to use a C library from Python using Cython is the Gnu Scientific Library, gsl. The goal here is to compare how easy it is to do it using Cython or weave. Following up on my previous post about how Cython could be used to improve the performance, I wanted to show how easy it is to interact with a C library. Here is the example of ta-lib : TA-Lib is widely used by trading software developers requiring to perform technical analysis of financial market data. ta-lib has a SWIG Python interface but I wanted to have my own quick and dirty interface to one specific function. It would be interesting to compare the effectivness of the SWIG interface compared to the Cython (for a later post). Playing with Mayavi, I wanted to find an easy way to use the colormap in an mlab.surf() call to display of fourth dimension. It is a very nice way to explore datasets. 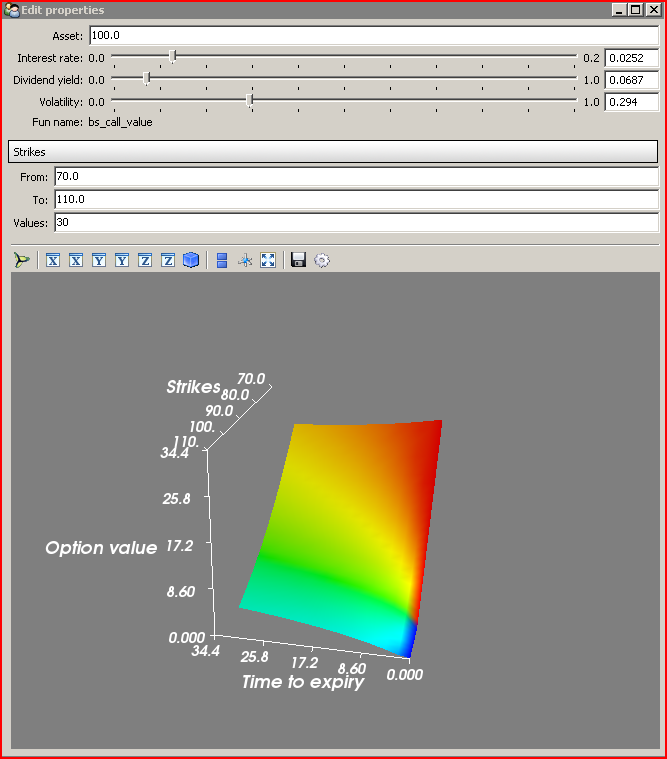 The image here below shows an option valuation tool that overlays the Black & Scholes call delta value on top of the surface made using the strikes, time to expiry and Black & Scholes call value. How can you do it ? Further to the post I wrote on the MKL performance improvement on NumPy, I have tried to get some figures comparing it to Matlab. Here are some results. Any suggestion to improve the comparison is welcome. I will update it with the different values I do collect. Each line is linked to the corresponding Python function in my test script (see my MKL post). The results are interesting. Tests have been made with R2007a and R2008a versions and compared to and EPD 6.1 with NumPy using MKL. Eig : Elapsed time is 0.718934 seconds. Svd : Elapsed time is 17.039340 seconds. Inv : Elapsed time is 0.525181 seconds. Det : Elapsed time is 0.200815 seconds. Dot : Elapsed time is 0.958015 seconds. Eig : Elapsed time is 1.235884 seconds. Svd : Elapsed time is 25.971139 seconds. Inv : Elapsed time is 0.277503 seconds. Det : Elapsed time is 0.142898 seconds. Dot : Elapsed time is 0.354413 seconds. After the relase of EPD 6.0 now linking numpy agains the Intel MKL library (10.2), I wanted to have some insight about the performance impact of the MKL usage. What impact does the MKL have on numpy performance ? I have very roughly started a basic benchmark comparing EPD 5.1 with EPD 6.0. The former is using numpy 1.3 with BLAS and the latter numpy 1.4 with the MKL. I am using a Thinkpad T60 with an Intel dual-core 2Ghz CPU running Windows 32bit.
! The benchmarking methodology is really poor and can be made much more realistic but it gives a first insight. Contrary to what I said at the last LFPUG meeting on Wednesday, you can control the maximal number of threads used by the system using the OMP_NUM_THREADS environment variables. I have updated the benchmark script to show its value when running it. I took some of the often used methods and barely compared the cpu time using the ipython timeit command. The results are interesting 752ms for the MKL version versus 3376 for the ATLAS. That is a 4.5x faster. Testing the very same code on Matlab 7.4 (R2007a) gives a timing of 790ms. Results are 4608ms with the MKL versus 15990ms without. This is nearly 3.5x faster. Results are 186ms with the MKL versus 400ms without. This is 2x faster. Results are 666ms with the MKL versus 2444ms without. This is 3.5x faster. Linear algebra functions show a clear performance improvement. I am open to collect more information on that if you have some home made benchmarking. If the amount of information, we should consider publishing the results as official benchmark somewhere. For those of you wanting to test your environment, feel free to use the script here below. You are currently browsing the archives for the EPD category.